Get Movin’ Music Player is rated 5.0 out of 5 by 7. It's entertainment to go - the Bright Starts™ way! 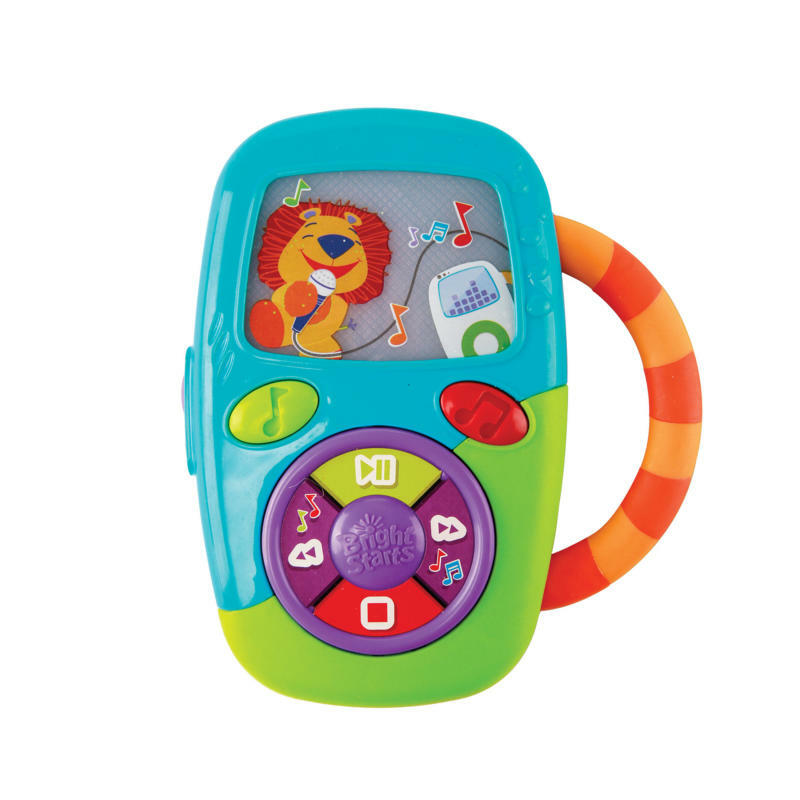 The Get Movin’ Music Player™ has fun buttons that activate 20+ silly sounds, lively melodies and fun phrases! Colorful lights dance across the screen along with the music. The handle is the perfect size for little hands to grab and take along. Rated 5 out of 5 by Annies Mimi from Great for special-needs child My granddaughter is 14-years old, with severe developmental delays and autism. This toy is one of her absolute favorites, because she doesn’t have to “do” anything to make it work — she just presses it to her ear, and that action presses the buttons to make it work. The toy is just the right size for easy grasp, and it is very durable. She has loved and used this toy continually for many many years. We just now had to change out the batteries for the first time tonight, and I thought I should come here and order another one of these in case the first one ever quits working. I *highly* recommend this toy for all children, but especially for special needs children. Rated 5 out of 5 by Annies Mimi from Great for special-needs child My granddaughter is 14-years old, with severe developmental delays and autism. This toy is one of her absolute favorites, because she doesn't have to "do" anything to make it work - she just presses it to her ear, and that action presses the buttons to make it work. The toy is just the right size for easy grasp, and it is very durable. She has loved and used this toy continually for many many years. We just now had to change out the batteries for the first time tonight, and I thought I should come here and order another one of these in case the first one ever quits working. I *highly* recommend this toy for all children, but especially for special needs children. Rated 5 out of 5 by Mamaw from Tough This has lasted 7years, through 4 kids! It has been their favorite. Rated 5 out of 5 by sajones1 from Baby loves it! My baby loves the music and lights on this toy. When held in front of him, this was the first toy my 3month old reached for! He's almost 5 months now and still enjoys it! I like the variety of sounds too. Rated 5 out of 5 by Dencon from My favorite musical toy! My baby loves to play with this. The buttons are easy to push. I love the variety of songs and sounds. I never find it obnoxious or feel the need to hide it.